Last Sunday the girls and I had a playdate arranged to meet up with Emily's old school friend. We had planned to meet at Retroskate Great Yarmouth. For those of you who don't know, Retroskate is situated on the seafront in town, adjoined to The Marina Centre. As you enter, you can see the skating arena immediately and the girls were jumping about with excitement! It was fairly quiet when we arrived and we quickly paid and were given wristbands and skate hire cards. In order to obtain your skates you will need this card and to hand in your own footwear. Prices start from just £4, full details on pricing and opening times are available here. Around the side of the rink you will find the Skate hire desk, a seating area with some arcade-style games, the skate shop, toilets, cafe and Party Area. Both of our girls have had Retroskate parties and we found that they were very well looked after, plenty of food and jugs of squash. You get a choice of hot foods or buffet food. We've had both and found them equally as good. There is also a small skating area near the Cafe and Party zone for children under 5 years to skate. I've often seen older children in here and so long as they aren't messing about or stopping little ones from using it, then the staff are lenient. Whilst the girls were getting their skates on I popped back out to put the stamped car park ticket back in the car, then we found a table. The upper level of Retroskate has plenty of tables overlooking the rink and we found a great viewing point. Then the girls were off. We were joined by Emily's friend soon after we arrived and whilst she was getting her skates on, my two whipped off to get some drinks. Kids soft drinks and cup drinks start from just 50p but mine always ask for a Slushie when we go and they are just £1.50. And I like to treat myself to a large Mocha, priced at £1.60. Although this is from a machine it is really nice, plus it's served in proper mugs! Not them horrible plastic disposable ones. 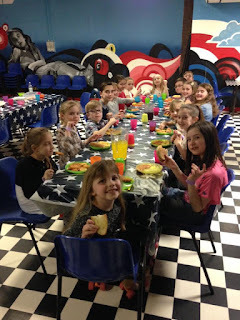 We also got the girls to choose their lunch before they disappeared off on the rink again. Retroskate has a wide range of choice on their menu, all reasonably priced and the bits we have tried have been ok. The Sweet Chilli Chicken Panini is pretty good! The girls enjoyed a good few hours whizzing around and having great fun, whilst us mums enjoyed a drink and a natter. During the regular public skating, the team play games which you can either join in with or sit out. Depending on the game, you can skate around the edges but others require non-players to leave the rink. Games only last for a few minutes at a time though. Emily enjoyed the Limbo and did pretty well in this. Whilst her friend revelled in Tag! Our girls and their friend thoroughly enjoyed their time at Retroskate and are already planning their return visit! For more information check out their website or follow them on Facebook! Chris is a big fan of King Prawns, so when I served this for dinner the other night he was over the moon! Super quick and easy, virtually no prep needed and cooks within minutes. Lemon - zested and then squeezed. Firstly pop a frying pan on a high heat and then put a saucepan of water on to boil. Once boiling, add the noodles and leave to cook. Meanwhile, the frying pan should now be hot so add small drizzle of olive oil (I just use a silicone pastry brush to spread a small drop around the pan. Then throw in the King Prawns and toss them around until cooked through. They will turn from a grey colour to a pink. Whilst these are cooking I slice the mange tout into strips, zest the lemon and half it. Now you need to add the seasoning and garlic to the cooked prawns and stir, then its time to add the spinach and mangetout. This spinach will wilt quickly so now you need to throw in the cooked, drained noodles, chopped parsley, lemon zest and a generous squeeze of a lemon half. You can easily adapt the recipe to suit your taste, try with chicken or salmon. You could use alternate veggies for a more colourful dish. During a recent visit to The National Museum of Wales we got to view the Quentin Blake Exhibition. This has been running from July 16th and goes through until November 20th and celebrates the wonderful work of the popular author and illustrator. The exhibition is free, as in entry to the museum itself, and is located upstairs. We enjoyed looking at the many works of Quentin Blake, discovering his various work tools, film footage of him working and exploring the artwork. In a large, open and bright area of the room was a long table with books illustrated by Quentin with paper and colouring pencils for visitors to try their hand at their own illustrations. At the far end of the exhibition the walls were painted in a muted grey. There were alcoves and the ceiling was much lower, giving the area a much more..... intimate feel. There were no display units in this area, just illustrations with scripture painted underneath each one. I felt drawn down to this darker, quieter area. Away from the humdrum and busy nature of the rest of the exhibition, the mood in this part was hushed. Along the three walls in this area were large illustrations from Micheal Rosen's Sad Book, illustrated by Quentin Blake. I hadn't read this book before and took a casual browse along, viewing the artwork. As I went along and started to read the writing underneath I became drawn into the story so I returned to the start. The story deals with grief, more specifically Michael Rosen's own grief at losing his son Eddie to meningitis at just 18 years old. It opens with an apparently happy portrait of Michael. Colourful and smiling widely at the reader, wearing a bright red shirt, you initially view this man as relaxed, friendly. But as you start to read, the words make you look again and you see him in a new light. "This is me being sad. Maybe you think I'm being happy in this picture. Really I'm being sad but pretending I'm being happy. I'm doing that because I think people won't like me if I look sad." When you read that, you look back at the portrait and the strained eyes, the forced smile, the ragged and unshaven look of a man in pits of despair are suddenly evident. In the next illustration you see Michael's true emotions. The story goes on to talk about his son Eddie, introducing the reader to memories of Eddie, from baby through to child and then as a teenager. Happy family memories, snapshots of special times, fun times, happy times. Then the poignancy of the last photo. The blank photo, the missing memories. "because he's not there anymore." Michael shares the raw emotions he experiences as he swings from needing others and wanting to talk, to the absolute forsakenness and needing to be alone. He opens up to the reader about how we all experience these feelings at times and the illustrations cleverly change to feature other people feeling sadness. It comes along and finds you." One page simply depicts Michael sitting alone, in the grey light of a bedroom, perhaps his son's bedroom, now empty, unused and bereft of life. As the story continues the images show Michael trying to walk his way through normality, always depicted in grey in contrast to the bright colours in the pictures of everyday life going on around him. To the reality that there will be no more candles for Eddie, no more happy memories. The wretchedness of the last picture which is left with no words manifests the sorrow, the dark grief that this Father is left with. I finished viewing the illustrations with a thick lump in my throat and rather wet eyes! When returning home I had to find a copy of this book to read it in it's entirety. A wonderful book for children to help them to deal with and understand loss. To realise their feelings and to start to comprehend that these emotions are normal and, yes hard, but felt by everyone at some point in their lives. We recently enjoyed a countryside walk round Strumpshaw Fen, Norfolk. The Fen is one of the many RSPB reserves around Great Britain and is found in the heart of the beautiful Norfolk Broads. A vast range of Broadland wildlife and natural habitats, this is a wonderful and peaceful area to visit throughout the year. In fact, each season offers it's own treasures and pleasures, from the blooming Spring to the colours of Autumn and everything else either side. We joined the RSPB in late Spring but until now we hadn't visited, so on this beautiful sunny Autumnal Sunday afternoon we headed off. Chris had a rough idea of how to get there and we soon found the turn off from the A47 between Great Yarmouth and Norwich, we then followed the signs to Strumpshaw. This was a quaint little village and the Fen was clearly signposted throughout. It was a little further than expected and we began to think that we may have missed it at first but then spotted the RSPB sign and pulled into the free car park. RSPB members, under 5s and carers accompanying registered disabled visitors: free. Non-members: Adults £3.50, concessions: £2.50, children (5-17 years): £1.50. One child per family goes free. We went into the Reception area and we were greeted by the very friendly assistant. Once she heard that this was our first visit, she was eager to let us know some of the things we might be able to see and to explain the various routes. In the Reception I noticed they have Wildlife Explorer's Backpacks for children available at £3 each, plus they advertise a range of other activities from seasonal events, pond dipping (Easter to October Half Term - £2 per kit), hands-on family events during school holidays and much more! I even noticed that they have a Ladies Running Group there regularly! For full details on upcoming events please visit their website. Once we had signed in we set off along the first part of our trail. 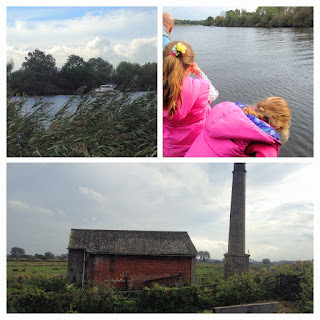 This was a pleasant trail called the Fen Walk and afforded us many natural wonders to explore and enjoy. We went past the pond dipping area at the start of the trail and had a little look about, I think we will be having a try at this next time. Further along the walk we found ourselves walking alongside a river which was a good time to stop and enjoy the view. The calm waters stretching out into the distance and dragonflies flitting in and out of the reeds. Whilst we watched we saw a leisure boat coming along and the girls enjoyed waving as it passed us by. As the path turned left away from the river we found the old Pumping House, originally introduced to drain the fen in the 1700's and later replaced by this building in the 1800's, this pump is now redundant but still an interesting relic to view. We continued our way along, heading away from the river and with dykes on either side, the girls were fascinated with the build up along the path from the dredging which had been carried out. They started poking around the muck with Chris and discovered that it was a very heavy clay based soil. Emily insisted on taking a handful along with her for the rest of our ramble! Shortly we came upon the junction to the Woodland Trail and had a choice, continue to follow the Fen Trail or turn off and enter the Woods. For the girls there was no question and we found ourselves leaving the low Autumn sun and venturing into the shaded woods. As we walked further into the trees, the damp woodiness and abundant fungi gave the woods a sensory enhancement. Alongside the footpath through the trees we happened upon log piles and nearby stumps. The girls made a discovery in each of these stumps, they all seemed to have been made into a dish shape on the top and were full of rain water, we presume for the birds and wildlife. With the added fallen leaves, Emily thought they were more like Fairy baths! Either way they were very pretty and a great way of accumulating fresh water without the use of artificial containers. There were several clearings along the Woodland Trail and many had natural ponds and on a couple of occassions we could see through to fields with horses grazing. After a while we turned into the last stretch towards the end and along here we paused for a rest and the girls decided to clamber about on a large wooden gate, ever the one to snap a photo of the girls Chris managed to capture this beauty! Then it was time to head out, picking blackberries on the way, we only managed to find a few as it was the end of the season for them but I bet a few weeks before this the bushes would have been bountiful in juicy berries. Once we were back at the Reception, the lovely lady asked us all about our walk and we treated ourselves to hot chocolate and flapjack before heading home. Drinks and snacks were easily priced at £1 each and just outside the reception there are picnic benches where we sat to enjoy our refreshments. On the way in and out of the reserve you pass a roped off area with plenty of bird feeders which were certainly attracting hungry birds when we visited and adjacent to this a bumper flower bed with foliage planted to attract butterflies and bees. We also spotted graceful swans along our walk. Along the trials there are a few hides and we did have a peek in these to see what we could spot, the girls didn't completely grasp that they needed to be quiet in these so as not to scare away the birds so we didn't stay too long as there were other people enjoying some spotting. There is also a Meadow Trail which is open in Spring and Summer only so we will definately have to return for this. 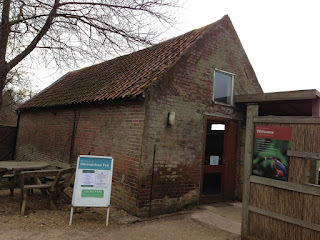 To find out more about Strumpshaw Fen then please visit their website or find them on Facebook. We can't wait to return and enjoy the beautiful scenery and the added benefits of the fresh air, exercise and family time. Next time we need to remeber that wellies are a must!